It was 6 a.m. and the shuttle from the hotel to the airport was driving through the parking lot when Beverly Black, the Fuller Center’s Director of Donor Development, made this exclamation. Never mind that we were traveling to Haiti that day – the woman needed her lipstick. Laugh if you will, but I believe this exclamation in the early morning hours, when I could barely think, revealed her character – the character of a woman who leaves not even the tiniest detail untouched or unaccounted for. The character of a person I’m glad to have as on our Global Builders trip to build homes for those in need in Haiti. We eventually made it out of the parking lot, past security and through our first flight. Two hours later in the Miami airport, Beverly and I met the rest of our 11-member group, which is especially unique not only because a majority are African-American women, but also because of their diverse backgrounds and professions, which range from a math professor to a pastor to a few business women who own and run companies and, of course, our Fuller Center ambassador and HGTV star Kimberly Lacy. All of these women without exception are extremely smart, gifted and capable. And all greeted each other at the Miami airport with hugs, despite the fact that most had never met before. But they all have a common goal that binds them together: When the trip was still in the planning stages, these women named themselves the “quest sisters,” seeking to join forces in order to help put an end to poverty housing. “Not many African-American women are in the missions field,” Beverly told me. So that’s why several months ago, she and Kimberly, our co-leader on the trip, decided to change that. Today we took our first step toward that change and toward that quest when our feet left the plane and hit the Haitian soil. After hastily making our way through a covered, gated tunnel, we threw our luggage in the waiting van and piled in. A drive through the streets of Port au Prince is not for the faint-hearted. Cars and vans pack the roadways, brave cyclists wend their way in and out of traffic, bustling pedestrians make mad dashes here and there, and all fight for space where there seems to be none. Car horns blare, music plays, people fling lyrical Creole phrases through the air. Bold splashes of color on ubiquitous hand-painted signs, corner vendors filled with bric-a-brac and women carrying baskets of ripe fruit match the constantly unfolding cacophony. Today we were also introduced – or perhaps reacquainted – with the glaring, ugly face of poverty. Most noticeable was the pervasive, acrid stench of garbage burning that filled our nostrils – Haiti has no infrastructure, no system in place to dispose of trash, so they simply burn it. Corrugated tin shacks line the roads, and children walk barefoot through the streets. I already saw tears of compassion forming in the eyes of some of our group members. Our ride neared its end as we pulled into the Auberge du Quebec hotel, an oasis so calm it’s like we left the country again. But though the northern view from the balcony overlooks turquoise waters and palm trees, the western side overlooks slums and leftover rubble from the earthquake, a sobering reminder of why we’re here. Later on in the evening, we were briefed on the project, which we’ll begin working on first thing Monday morning, by Jonny Jeune, director of The Fuller Center’s Covenant Partner organization in Haiti called Grace Fuller Center. Its name is derived from one of our primary partners in Haiti, Grace International. Grace International is a faith-based, Haitian-run organization started by Jonny’s parents, Dr. Joel and Doris Jeune in 1974. Over the years, they’ve built partnerships with other organizations like The Fuller Center, Project Eden, Forward Edge, eMi and Project Gaia, and they strive to impact lives in Haiti through the oversight and management of their 270 churches, 65 schools, 3 orphanages, a medical clinic, a hospital, and a home for elderly widows. Lambi, which is where we’ll be building block and concrete homes sponsored by 3M this week, is an impoverished area that was hard-hit by the 2010 earthquake. This is by no means the only place that needs help, however. 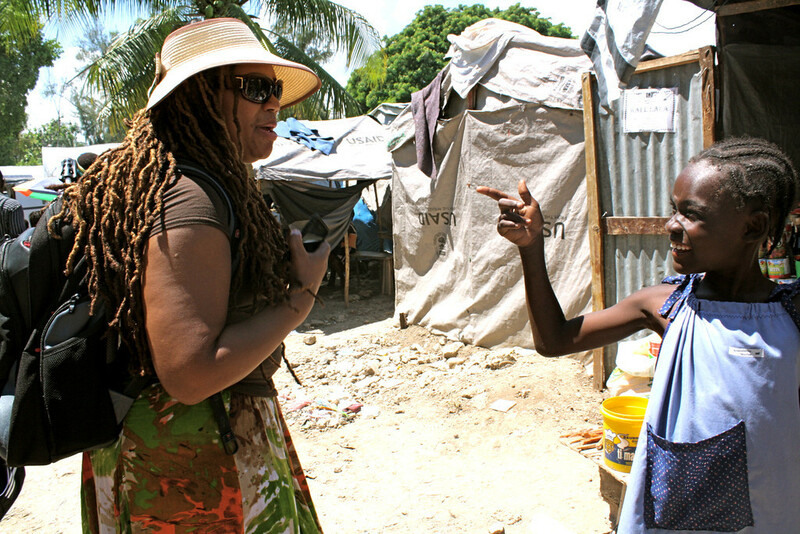 “Eighty percent of Haitians are basically on survival mode … What you see on the news is basically true,” Johnny said. Although the news, rife with depressing statistics, is basically true, my hope is that it’s not the truth in its totality; that there’s still plenty of room for hope, and that organizations and groups like ours can help manifest that hope and positively affect the future for Haiti’s children. And that, like Beverly, we all insist on having beauty and goodness in the details, even if it means going out of our way just a little. Find out more about The Fuller Center’s African American women’s Global Builders team.